The age-old question of "what will I be when I grow up" gets a hilarious twist in this stylish and clever story. A pup and his father contemplate his grand future while looking at other Great Dogs in their family. Will he be a marathon runner like Uncle Tibor, the fastest dog in the family? Will he be an astronaut like Aunt Yuki, who reached for the stars? Or maybe a teacher like Uncle Scooter, respected by all? No matter what, says his father, he will be a GREAT dog! 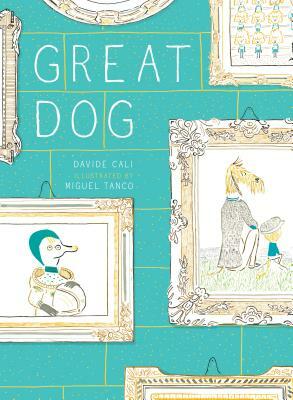 Davide Cali's tongue-in-check writing and Miguel Tanco's unique and funny illustrations bring these great dogs to life and will have readers giggling from start to finish. With gatefolds that show the real story behind the characters and a surprise twist at the end, Great Dog is a winner for kids and parents alike! DAVIDE CALI began his career in 1994 as a cartoon writer for the Italian magazine Linus. He began writing children's books in 2000, and since then he has published over one hundred books for children, including Snow White and the 77 Dwarfs and Cinderella and the Furry Slippers. Cali has won a Bologna Ragazzi Special Award, the Switzerland Enfantaisies Prize, the Baobob Prize, the Belgium Libbylit Award and France's SNCF award. His books have been published in France, Italy, Austria, the United States and Canada, and translations of his books have been published in eighteen countries. Davide lives in Genoa, Italy. Award-winning artist MIGUEL TANCO is a children's book author and illustrator. He teaches illustration and organizes creative workshops for kids in Spain, where he was born and raised, and in Italy. He has published over forty children's books including You and Me, Me and You; Les Farfelus; and The Story of Cyrano de Bergerac. He lives in Milan with his wife Federica and their two great sons, Pablo and Javier.